DNA typing of non-human DNA is a fast developing area of research and professional practice. The application of DNA typing in wildlife forensic science is one of these prime uses of DNA typing and is gaining increasing profile. The use of DNA profiling in wildlife forensic science falls into two broad areas: species testing and genetic linkage. Species testing answers the question ‘what species is this?’ and genetic linkage answers the question ‘did these two samples come from the same organism or population?’ Wildlife DNA Analysis: Applications in Forensic Science provides an accessible introduction to both of these key areas. Clearly structured throughout, the introduction highlights the different types of crime where these techniques are regularly used. This chapter includes a discussion as to who performs forensic wildlife examinations, the standardisation and validation of methods, and the role of the expert witness in this type of alleged crime. This is followed by a detailed section on the science behind DNA typing including the problems in isolating DNA from trace material and subsequent genetic analysis are also covered. The book then undertakes a comprehensive review of species testing using DNA, including a step-by-step guide to sequence comparisons. A comparison of the different markers used in species testing highlights the criteria for a genetic marker. A full set of case histories illustrates the use of the different markers used. The book details the use of genetic markers to link two or more hairs/feather/leaves/needles to the same individual organism and the software used in population assignment. The problems and possibilities in isolating markers, along with the construction of allele databases are discussed in this chapter. 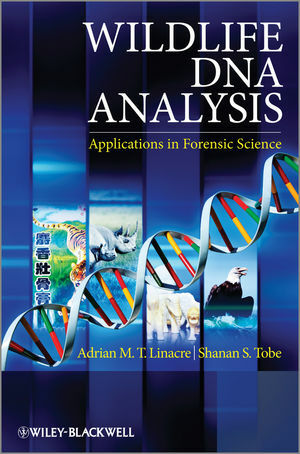 The book concludes with evaluation and reporting of genetic evidence in wildlife forensic science illustrated by examples of witness statements. •Case studies throughout to link theory and practice and to highlight the use of DNA testing in species testing.